Old Dominion once again add new dates and cities to their anxiously awaited 2019 ‘Make It Sweet Tour’. Extending an already stacked schedule for the new year, the multiplatinum group add 14 shows throughout April, May, and June. These dates begin April 10 in Casper, WY at Casper Events Center, include gigs across the country in various markets, and conclude with a festival appearances at Country in the Park in West Windsor, NJ on June 1st. See full routing below and click HERE for more info! The “Make It Sweet Tour” will kick off on January 18th at Allstate Arena in Rosemont, IL to a sold out crowd! Due to demand, the band is releasing a number of their internal holds out to the public. 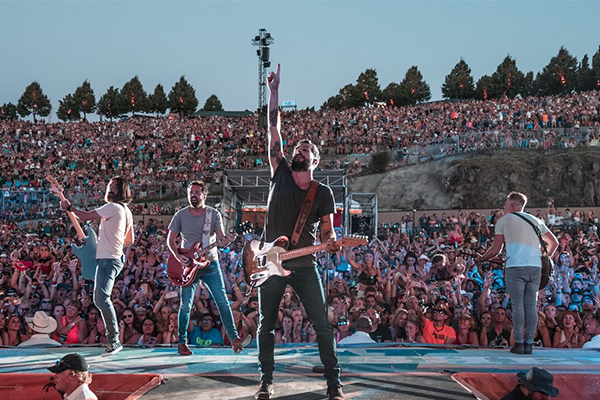 By the end of 2018, Old Dominion had performed 136 shows, including sold-out European and Canadians runs, dozens of festivals, and opening for Kenny Chesney on his summer stadium and arena tour. They also took home the award for “Vocal Group of the Year” at the 52nd Annual CMA Awards and at the 53rd Annual ACM Awards. Additionally, the band received a nomination for “Country Duo/Group Artist” at the 2018 Billboard Music Awards. In addition to clocking millions of streams, Old Dominion’s most recent single “Make It Sweet” reached #18 at Country Radio and is continuing to rise. The track’s release marked the group’s first new original release since the arrival of the chart-topping Happy Endings in Summer 2017. Click HERE to listen! The upbeat “Make It Sweet” unlocks the next chapter of Old Dominion. Rustling acoustic guitars and pedal steel bristle up against heartfelt verses before the hashtag-worthy handclap-driven refrain—“Life is short, make it sweet”—takes flight. The song culminates on a rafter-reaching guitar solo and show-stopping vocal performance. They uncovered the cinematic music video for the song (HERE) and performed the single on The Ellen DeGeneres Show (HERE).